A sheet of ice isn’t the first thing that comes to mind when envisioning Northern Nevada’s expanses of sage, but one group is hoping to change that perception, potentially bringing a full-sized ice arena to south Reno as soon as late 2016. What is now the Greater Reno Community Ice Skating Association started about two years ago as a passion project for a group of residents with a love for hockey and figure skating but disappointed in the dearth of options for hitting the rink in Northern Nevada. As it stands, ice enthusiasts in the area have to travel to South Lake Tahoe or the Sacramento area to practice on an NHL-size rink, says ice skating association president Joel Grace. “There are kids out there that can be Olympic athletes or who could be professional hockey players or professional figure skaters and they just don’t have the opportunity right now,” Grace says. Grace, a New Hampshire native and Reno transplant who grew up ice skating on Lake Winnipesaukee, says it’s hard to believe a community the size of Reno doesn’t have a full-size rink of its own. 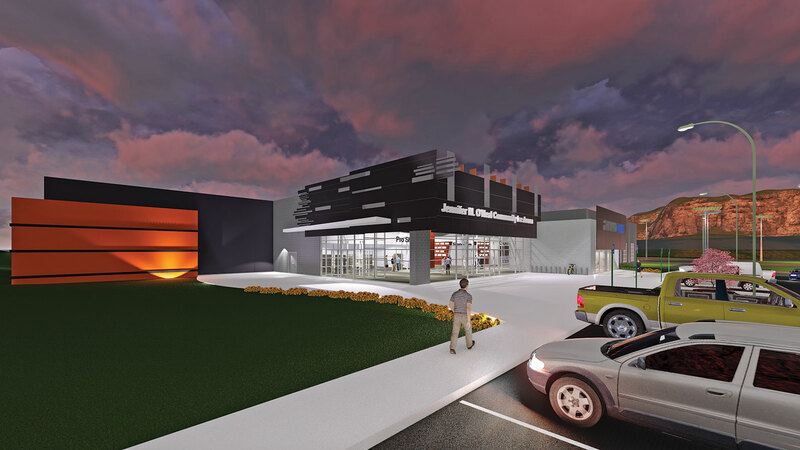 As envisioned, the Jennifer M. O’Neal Community Ice Arena would be located in the South Valleys Regional Sports Complex off Wedge Parkway. The approximately 45,000 square foot first phase of the project is estimated to cost $7 million and would include a building, ice rink, mezzanine for spectators, restaurant, locker room and pro shop. The second phase would be about 25,000 square feet, include a second sheet of ice and have an estimated cost of about $3 million. The ice skating association expects to fund the project through private donations and has already received a $2 million commitment from Incline Village’s Sean and Jennifer O’Neal Family Foundation. If approved and funded, the facility would become one of roughly 600 ice facilities that have opened in the U.S. in the past decade. Having a nonprofit own the arena through private donations is key to its eventual success, Grace says. The ice arena would be open seven days a week with hours from 6 a.m. to midnight, according to the association’s proposal. 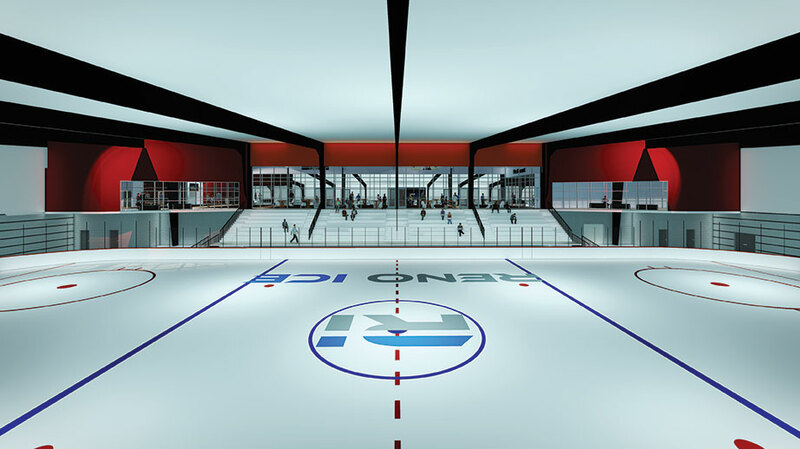 Everything from open skating to youth hockey leagues to figure skating to curling are included in the vision for the rink. The association is committed to the community and providing young people with opportunities to get on the ice, Grace says. A high-quality ice arena also has the opportunity to add to the area’s growing reputation as a sports destination, said Shelli Fine, director of sports development for the Reno-Sparks Convention and Visitors Authority. With its existing facilities, competitive rates and large bed base, Reno has attracted sporting events ranging from fast-pitch softball to taekwondo in the past few years. A decision on a lease for the proposed arena is expected from Washoe County in December. Securing a lease will allow the association to move the funding phase into high gear, Grace says. Information on donating to the rink is also available on the group’s website, www.renoice.org. Although Grace acknowledged the ice arena is not a done deal, he says he would be surprised if the idea doesn’t come to fruition, adding that the level of support has been inspiring. The group’s measured approach to accomplishing its goal is not unlike the advice one could give a beginner skier or, perhaps, even an ice skater. Michael Kilburg is a South Lake Tahoe-based writer and editor.